Ventilate tunnels, manholes, and other confined spaces using these kits. 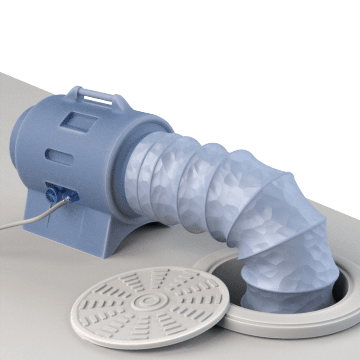 They contain a fan or blower, ducting, and other related parts that direct fresh air into those spaces and help prevent buildup of stagnant air and hazardous gases that can be unsafe for workers. 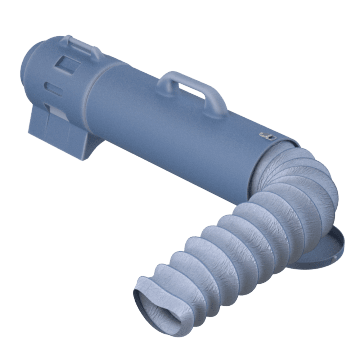 These kits contain an axial fan, ducting, and other related parts and are suitable for providing ventilation over short distances. Axial fans are generally quieter and lighter than centrifugal blowers. Designed for use in hazardous locations where sparks and sources of ignition are prohibited, these kits include an axial fan, compatible ducting, and related parts for bringing ventilated air into confined spaces without igniting gas, dust, or vapor in the space. Axial fans are generally quieter and lighter than centrifugal blowers.